Does breaking free require breaking the rules? Cassie Gilbert lives every day in the shadows of her deceased mom’s rebellion. But now that she’s seventeen, she finds herself longing to break away from her grandmother’s suffocating rules, experience what it’s like to be a regular teenager, and fulfill her songwriting dreams. James Russo, former American Spotlight contestant, escapes to small town Willow Creek, SC hoping to flee from his tarnished past. When a school project pairs him with the shy principal’s granddaughter, he’s determined to get to know this Emily-Dickinson-obsessed and typewriter-using girl. His plan? Convince Cassie to co-write songs for his demo album. As Cassie gets to know James over “project meetings” (more like opportunities to match her lyrics with his melodies), she becomes intrigued by his sense of adventure and contagious passion for music. But soon, his past becomes exposed. Cassie’s left to wonder—did she make the same mistake Mom did by falling for the bad boy? Then, Grandma’s control pushes her over the edge. Cassie must choose between remaining in the chains of yesterday, or delving into her own freedom by completing the melody her mom left behind. “Like what?” James’s question lurches me back into the present moment, out of the thoughts that had me buried as he played our song for the second time. I laugh. “Alright, I get it.” My smile fades, though, because how could he tell? When James brought the song to a close, I couldn’t tear my gaze away from the keys. It’s mesmerizing, how the dance of his fingers can breathe life into a melody. But I’ve always wondered what would happen if I could play. 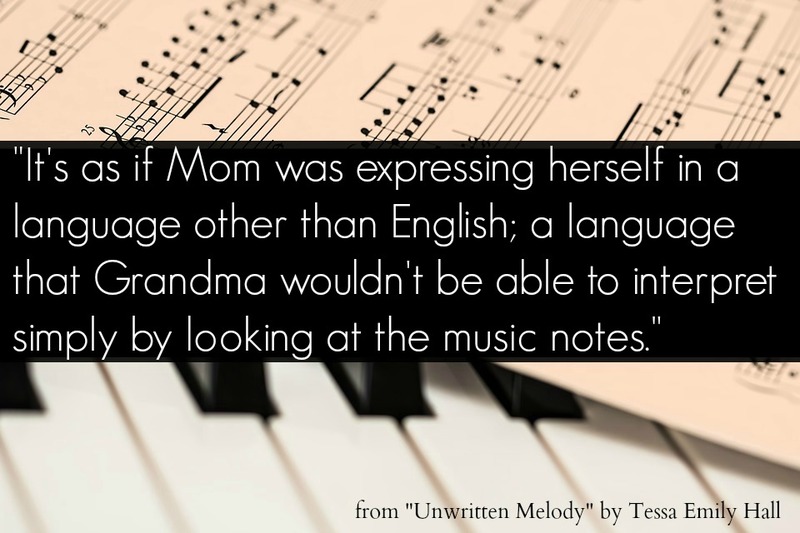 If I were allowed, would I pour my emotions, longings, and thoughts into music, just like Mom did? Would I be a natural, if I learned how to play? I often wondered if Mom’s legacy could, somehow—through the mysterious power of music—live on through me. And if the melody she’d begun on the music sheet could find its completion through me. That magnetic attraction he referred to? It’s doubled in size. And for the first time, someone—a famous musician—is offering to teach me a chorus on the piano. My feet plant themselves onto the ground, but it takes an extra dose of effort to stand. Not because I don’t want to, but because Grandma’s voice booms in the back of my mind, all the times she’s forbidden me from going near our piano. The floorboards squeak as I shuffle across the worn rug then lower myself onto the bench next to James. I’m not sure what’s more terrifying—sitting so close to James Russo, or finally being taught to play piano. But my hands stay glued to my lap. It’s as though the keys are alcohol, and if I take a sip, I’ll become drunk on its melody; my fingertips will be stained with the music notes, and I’ll come home reeking with its fragrance. James’s azure eyes stare down at me, inches from my face. “Follow my lead.” His fingers curl around my hands, and with the gentlest touch, he places them on the keys. His left arm wraps behind my back, over my shoulder, until his hand is clasped on top of mine. My heart flutters at our closeness, at the way his presence is a warm shield from the brisk air in this music room. I inhale a deep breath, almost intoxicated from his overpowering cologne and the fresh-out-of-the-wash scent of his sweater. And during the brief moment of him aligning my fingers along the keys, nerves mount, causing my chest to constrict. Who knows how many rules of Grandma’s I’m breaking right now? But when he places his fingers onto mine causing me to strike the first note, a soothing peace washes over me and calms my nerves. I feel myself relax as he guides me through the brief chorus. I don’t even know what he means by that. All I know is I’ve tasted this indulgence, and there’s no way I can resist the magnetic pull from this moment forward. Enter for your chance to win the Unwritten Melody Prize Pack! Two winners will be selected and announced on Tessa’s blog the final day of tour (Friday, December 9th) and will be notified via email. Tessa Emily Hall writes inspirational yet authentic YA fiction to show others they’re not alone—and because she remembers the teen life like it was yesterday (or a few years ago). The debut novel she wrote at 16-years-old, PURPLE MOON (Lighthouse Publishing of the Carolinas) was a Selah 2014 Finalist. 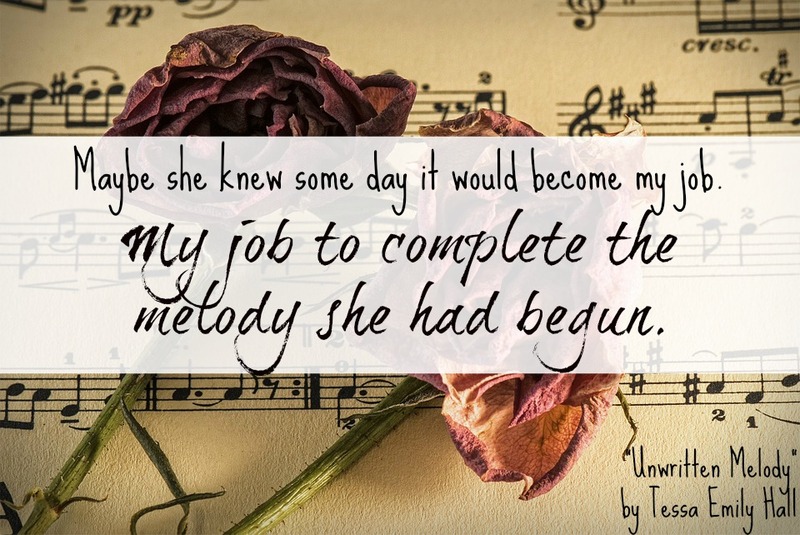 Her second novel, UNWRITTEN MELODY, releases with Clean Reads November 2016. She’s the Founder of PursueMagazine.net, a magazine that inspires teens to embrace their calling. 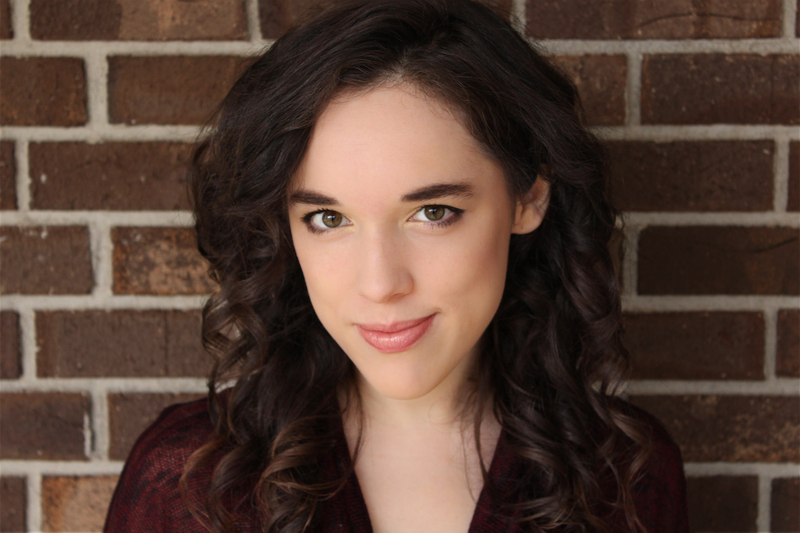 Tessa also enjoys helping writers achieve their dreams through her internship at Hartline Literary Agency. When her fingers aren’t flying 116 WPM across the keyboard, Tessa can be found making healthy homemade lattes, speaking to teens, decorating her insulin pump, and acting in Christian films. She writes in a small town nestled between the Blue Ridge Mountains and Southeastern coast. Her favorite way to procrastinate is by connecting with readers on her blog, mailing list, social media (@tessaemilyhall), and website. Don’t miss the next blog tour stop! Be sure to visit the following blogs on its designated tour date. You can also email tessaemilyhall (at) gmail (dot) com and request to receive the Blog Tour Packet. At the end of the tour, Tessa will send you the downloadable PDF that will contain all of the content from each blog tour stop.